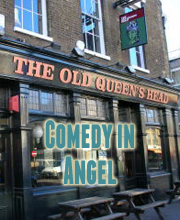 Laugh Out London comedy club is excited to again be one of several London-based comedy promoters to put on shows at an abandon city pub this Christmas season. Bob Slayer, the crazed genius behind Bob’s BlundaBus and the magnificent Heroes of Comedy venue at the Edinburgh Fringe, has exerted his powerful charms and once again secured the long-disused 27 Throgmorton Street – a former gentlemen’s club – and turned its basement into a magnificent comedy venue hosting innovative and alternative comedy throughout December. Bob’s Grotto of Comedy at the HoHo Theatre will play host to acts such as Stewart Lee and Jon Richardson and shows such as all-comedian take on Frozen and the now traditional Weirdos alternative pantomime. By promoting one-off, high concept innovative shows – with strictly no works parties allowed – we are quite literally reclaiming Christmas Comedy from under corporate noses. On Dec 8-11 we are supporting the Weirdos comedy collective to put on another alternative Christmas panto starring a host of the UK’s best comedians, including John Kearns, Harriet Kemsley and Pat Cahill. All profits from Weirdos for Christmas Number One will go to Great Ormond Street Hospital. And on December 18-19 we put have a weekend of amazing comedy featuring several huge names, such as Stewart Lee and Harry Hill, and rising stars such as Spencer Jones and LetLuce, all in aid of housing charity Shelter. Other comedians performing at Laugh Out London’s Christmas Comedy Weekend for Shelter include Henning Wehn, Isy Suttie, Robert Newman, John Kearns and Rachel Parris. Sign up to the mailing list to be first to know when tickets go on sale.